Accessed only by a scenic 45 minute seaplane ride, the virgin landscapes of this territory lend uniqueness to the resort and a feeling of serenity and contentment settles within you the moment you arrive. 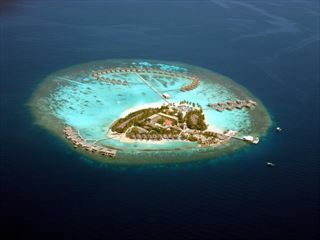 Irufushi is in the Noona Atoll amidst acres of vegetation surrounded by powdery white sand and a house reef. 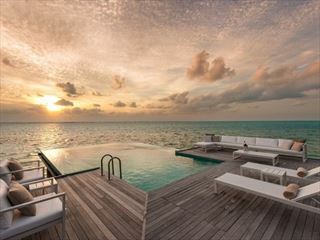 This luxurious 5 star resort hides 180 rooms well and is an excellent place for a honeymoon, special holiday or a return visit to the Maldives. There is a range of restaurants and bars, two pools, fabulous sandy beaches, land and watersports, excellent pristine dive sites and very well appointed accommodation. Beach Villas - For guests seeking an island hideaway, individual Beach Villas are nestled within the island’s natural vegetation, sufficiently secluded from the beach to ensure privacy, although close enough to catch shimmering glimpses of the lagoon. The front terrace is the place to relax in the oversized day bed in the refreshing Indian Ocean breeze. The bedroom, a large open space with high ceiling and an additional day bed provides the perfect sanctuary. The open air bathroom is set in its own enclosed private courtyard offering an i-spa bath (bathtub with water jets and iPod connection), an extensive sundeck with sun loungers, a large gazebo and two rain showers. Deluxe Beach Villas – Similar to Beach Villas with an additional sala (gazebo) on the beachfront, ideal for lazing the day away. Pool Beach Villas – The Pool Beach Villas are similar to the Deluxe Beach Villas and offer an abundance of space to relax, play or sleep. The living room, with its high ceiling and day bed is the perfect place to unwind, whilst in the secluded courtyard bathroom, a private lava stone pool gives a taste of al-fresco living. 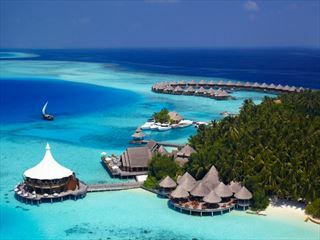 Water Villas - The Water Villas are perched on stilts over the clear blue lagoon, offering inspiring views of the Indian Ocean. Private sundecks lead into the water and a wonderfully refreshing swim is a mere step from the villa. The en-suite bathroom includes a relaxing i-spa bathtub and looks out to the private deck and lagoon whilst the shower has views of the crystal clear water. The villa has a wealth of day beds and couches to relax on as well as glass floor panels offering glimpses of the ocean. Horizon Water Villas - Similar to the Water Villas, the Horizon Water Villas provide more privacy and luxury to guests as they reach further out into the inviting lagoon. These peaceful dwellings come with their very own Jacuzzi on the private sundeck. Infinity Water Villas - Traditional Maldivian architecture is used to dramatic effect to create a luxurious suite for the discerning traveller. There is an abundance of space and light, the views are simply breathtaking and the lava stone private pool atop the sundeck adds to the overall impression of indulgence. The split level deck boasts a cabana and dining area. The bedroom, bathroom and living room are designed with more than a hint of decadence in mind and the i-spa bathtub is positioned overlooking the private deck and lagoon, along with the shower which has breathtaking views over the sparkling waters. Hidden Retreat - Nestled within the island’s tropical vegetation, the Hidden Retreat offers luxury and seclusion. Totally private, the Hidden Retreat combines spacious interiors with lush exteriors and encompasses two bedrooms and a large living area with stunning views of the landscaped garden courtyard, private pool and gazebo. Open air garden bathrooms feature the lavish i-spa bath and rain shower. Aqua Retreat - The epitome of over water island lifestyle, with sweeping panoramas of the Indian ocean, the Aqua Retreat comprises two en-suite bedrooms, a stunning swimming pool on the sundeck, Jacuzzi, private dining pavilion, along with a spacious lounge with 40” LCD entertainment console. Celebrity Retreat - This uber-luxurious retreat is designed for those who prefer to holiday away from other guests and provides a private beach and luxury boat on hand to transfer VIPs to nearby deserted islands or sandbanks. Designed as a private villa over two floors, it boasts three bedrooms with the master bedroom having its own private pool within the enclosed garden bathroom, three bathrooms, a billiards room, a gym and an enclosed garden with a private swimming pool, sun deck, lawns, water features, lush vegetation and an outdoor dining pavilion where gastronomic delights can be delivered around the clock. The upstairs lounge comes complete with the latest in digital technology. Guests are invited to indulge their inner-diva with treatments from the resort’s Spa in the suite’s own private spa pavilion, ensuring they never need set foot off their own piece of paradise. The Kidz Paradise, Koamas is one of the main feature of the resort, with playgrounds, rooms, dedicated pool, games, toys and activities dedicated to the needs and mood of the kids on the Island. The Kidz Paradise attendants provide caring and personalized service to the younger guests aged 3 to 12. Baby sitting service is available. Iru Restaurant - Casual buffet dining with tropical island flair. Breakfast is nothing less than the famous Hilton Breakfast and lunch the time for tantalizing light fare. For dinner we serve an international array of tempting selections. Flavours - An Asian culinary extravaganza. Flavours is the restaurant for Asian food lovers and those who are intrigued by the many subtleties of far eastern cuisine. Flavours houses the resort’s excellent collection of wines and is also the scene for weekly wine dinners, hosted by our sommelier. Islander’s Grill - A culinary journey where land and ocean meet. Islander’s Grill offers choice fare of the freshest fish, seafood and meat, grilled to perfection. On selected days, the pristine beach in front of Islander’s Grill is the scene of open-air gourmet dinners in the sand featuring seafood, meat and fine wine. The Trio - Food, wine and great ambience inspired by the Mediterranean. The Trio is the place to enjoy al fresco dining set above the turquoise lagoon. Don’t miss your daily highlight, the romantic symphony of lounge, tapas, wine and sunset. The Cellar - An over water wine cellar where guests can enjoy a more intimate dinner with vintage wines and a view of the ocean that is simply mesmerizing. Bamboo - The place to explore the many flavours of Asia, with light fare that includes South East Asian noodle and rice dishes, dim sum, sushi and sashimi. Surrounded by tranquil and lush tropical vegetation next to the Water’s Edge Bar.